When the time came for Stan Standing to shave his majestic beard before starting a new job, he wasn’t going to do it without making a statement. Having recently lost his Aunt, a woman with “adventure in her soul” to ovarian cancer, he was inspired to honour her by raising money for Ovarian Cancer Canada. But this wasn’t a simple fundraiser – or a simple shave. Stan aimed to attract attention for the cause by filming a video of him shaving his beard in mid-air after jumping out of an airplane at 10,000 feet. He started a GoFundMe campaign to raise $5,000, promising donors he’d share a video of the event once he’d reached his goal. Stan Standing, or “Stanimal” as his friends call him, is known for his fun-loving, adventurous spirit. 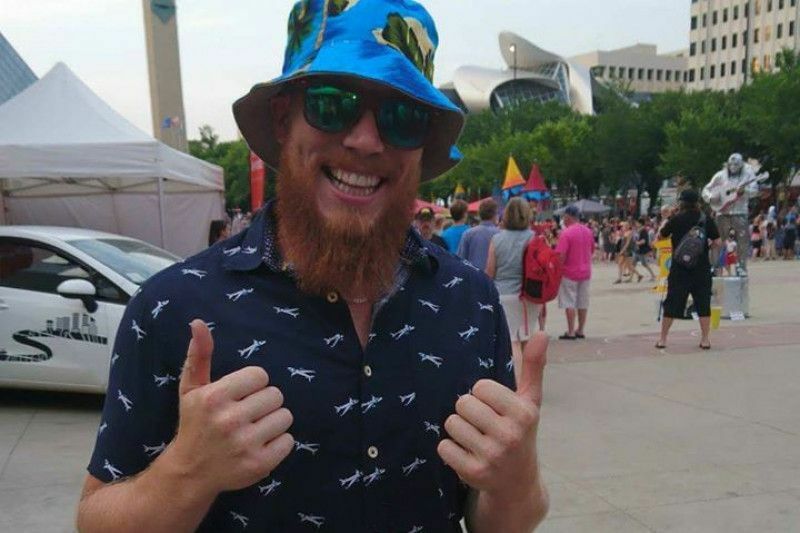 He started a GoFundMe campaign to raise money in honour of his late Aunt Lynn Standing-Whiten who died a year ago of ovarian cancer, promising to shave his beard while skydiving. “I could think of no better way to honour and tribute my Aunt Lynn in the spirit of adventure than by shaving my beard while falling towards the Earth at over 120 miles per hour,” he says. 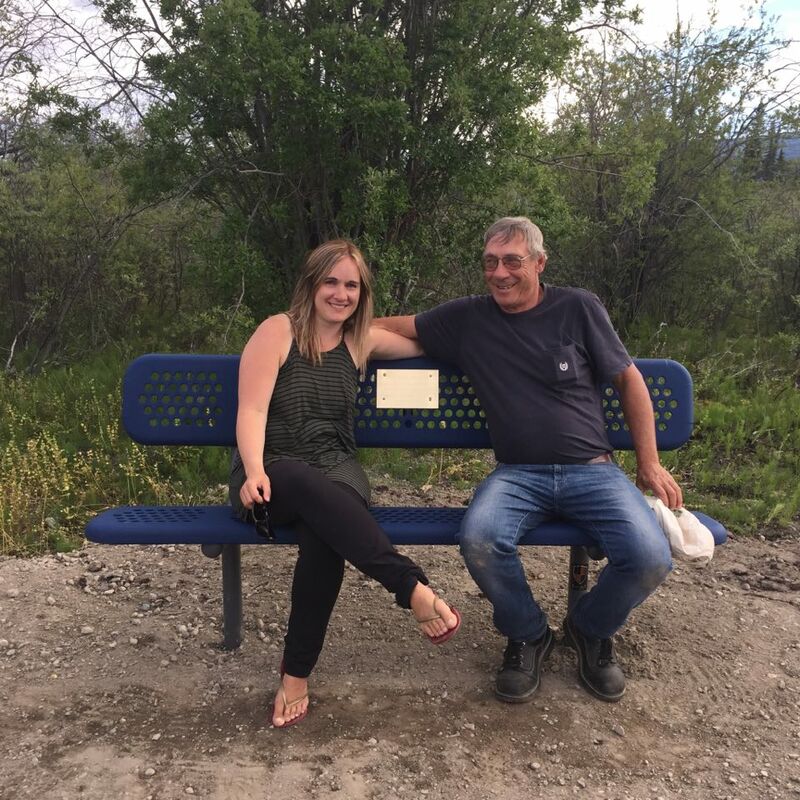 Stan Standing’s cousin Darcy and Uncle Roy sit on a bench on a nature trail in Marsh Lake, Yukon dedicated to his late Aunt Lynn Standing-Whiten. To film his sky-dive shave, Mr. Standing strapped a GoPro camera onto his chest. Jump master Lyal Wadden at Skydive Eden North also helped film Stan during the skydive. “I’m also singing a song while I’m doing this, but don’t want to give away the surprise,” Mr. Standing says. There is a teaser video but supporters will have to wait until Stan reaches his $5,000 fundraising goal to find out what the experience looked like, and what song he was singing at the time. He’s asking for a $1 donation and for followers to share the video to help keep his Aunt’s memory alive. For those who donate more than $100 he’ll also create an original piece of spray paint art – another one of his hobbies. Mr. Standing has signed up for the Ovarian Cancer Canada Walk of Hope with his team Shave Cancer 10000ft to continue to raise awareness and money to overcome this disease. “Life’s beautiful, and meant to be lived in the moment. That’s the way I live my life. You never know when those moments might turn into memories,” Stan says.